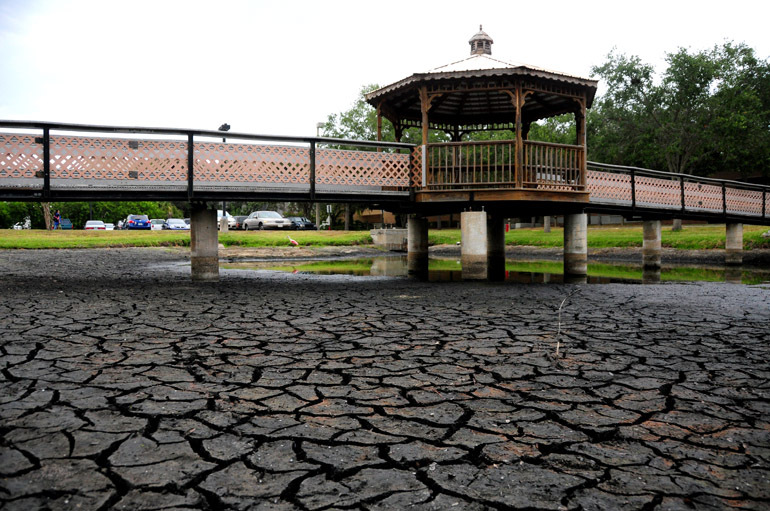 For more than a year, it hasn't really rained much in Brevard County. Or at least, not as much as it should have. This was the scene in the pond at my workplace -- until recently. In 2010, the National Weather Service in Melbourne recorded 12 inches less rainfall than the area typically receives. The summer of 2010 was virtually deficient of decent thunderstorms, which made it rather boring for weather photographers. Fortunately, the winter wasn't as horribly dry as some anticipated. The Climate Prediction Center in Maryland forecast below-normal rainfall for Florida during this season, which is usually dry for the state anyway. But we experienced a few frontal systems that dropped down from the Deep South, bringing us heavy rainfall in early April. 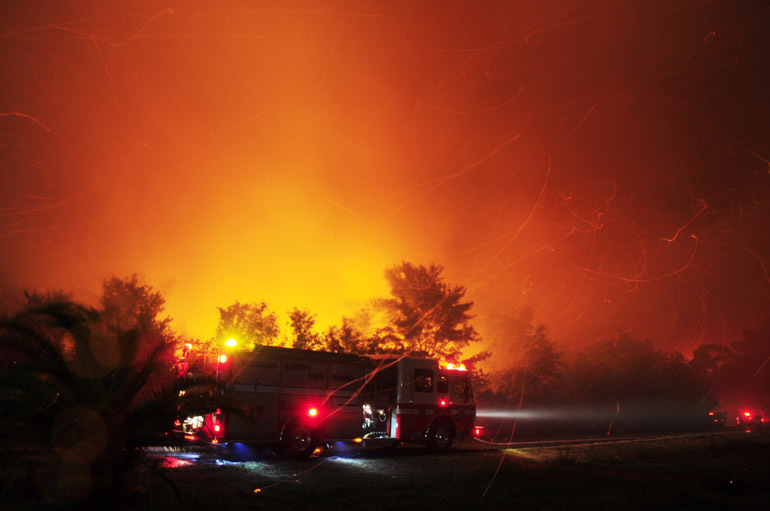 Brevard experienced one large wildfire before that: the 17,000-acre "Iron Horse" fire in Mims and Scottsmoor, which I covered tirelessly as a journalist for a whole week. May, however, was again bone-dry, and water levels dropped and forests burned -- though, luckily, not to any drastic extent. 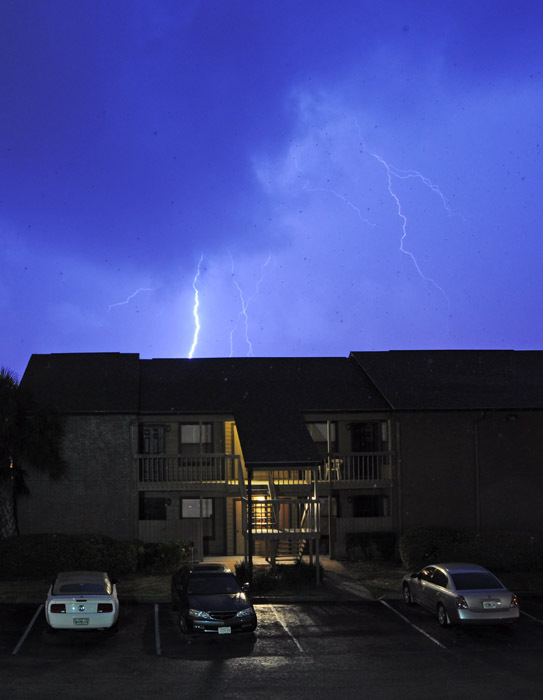 Florida's Space Coast usually starts to experience almost-daily rain showers and thunderstorms in late May. That didn't happen this year. But in mid-June, a shift in weather trends began. We started seeing the seabreeze off the Atlantic Ocean kick in and blow westward across the Florida peninsula. 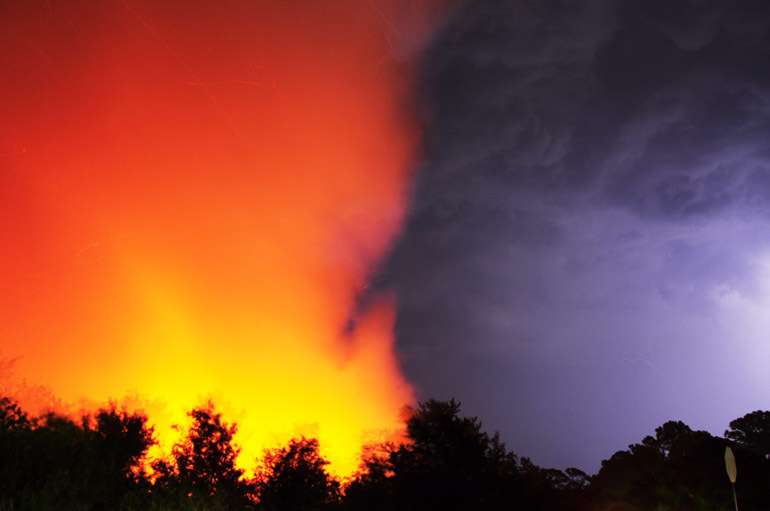 When it collides with the seabreeze from the Gulf of Mexico, thunderstorms form. This is Central Florida's storm-making machine, which makes it the lightning capital of the United States. The following photos document this shift as much as I possibly could. There were some days I was working and unable to photograph weather systems or was otherwise occupied with higher callings, like cute girls. And I'm lucky enough to have two of those in my life. The seabreeze often is visible on radar as a line of light moisture paralleling the Florida peninsula. It doesn't fall to the ground, however. 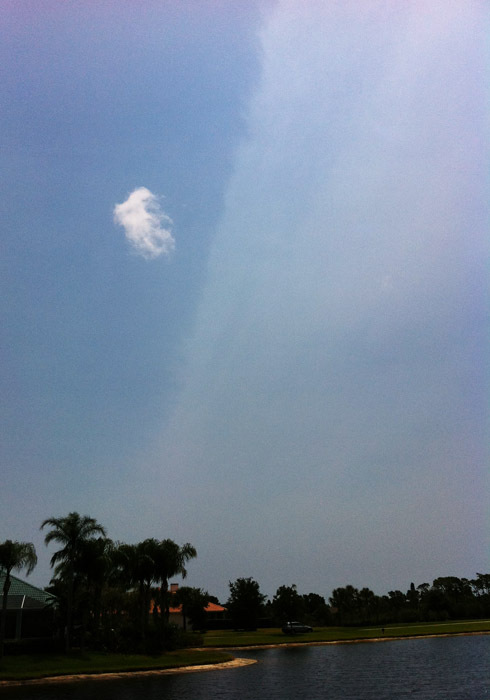 On this day, a clear line of upper-level moisture stretches across the entire sky. Showers formed on this day (when I snapped this picture with my phone while golfing), but they were far to the west of Brevard. Things started getting more interesting when a week upper-level area of low pressure dropped into Florida. 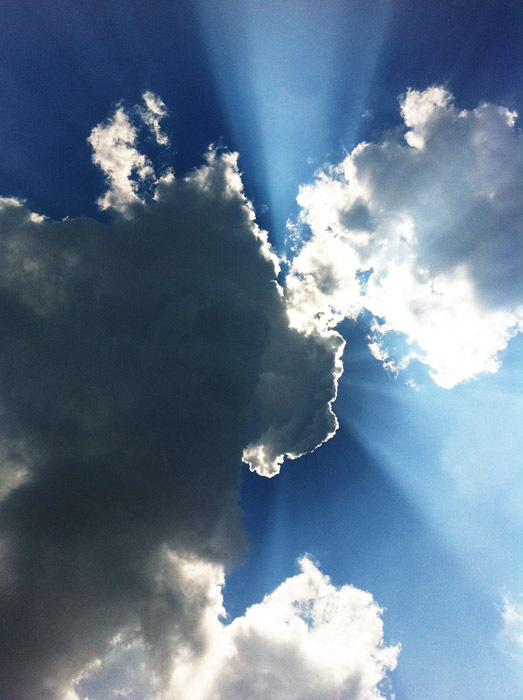 The trough interacted with daytime heating and convection, and gave rise to widespread thunderstorms. 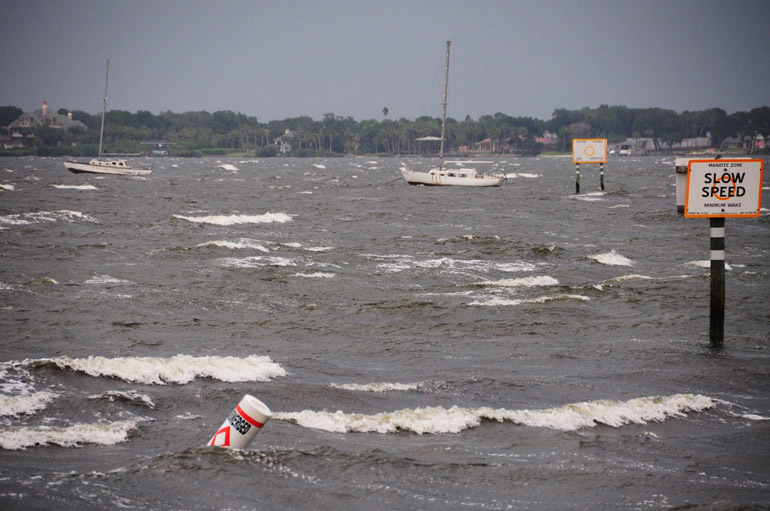 Above, a storm grazed the northern Melbourne area and made for choppy conditions on the Indian River. 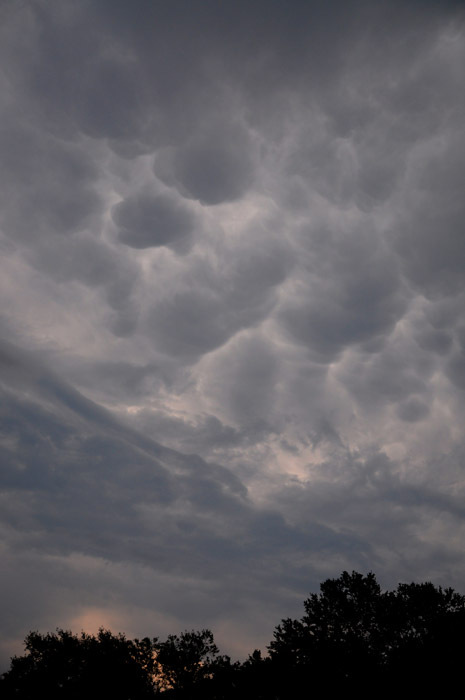 Some mammatus was associated with the first thunderstorm of the day. Just a few rumbles of thunder from this one. 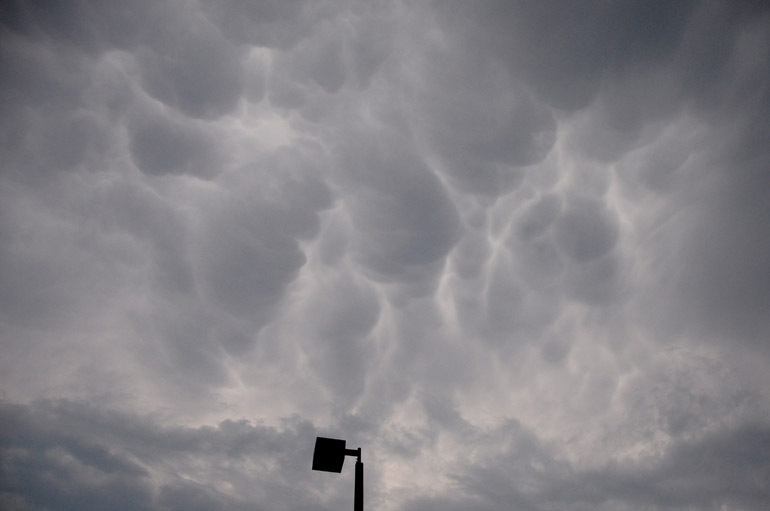 If you want to learn more about mammatus, go here. 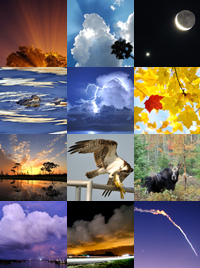 It tells you how they and other cloud types form. 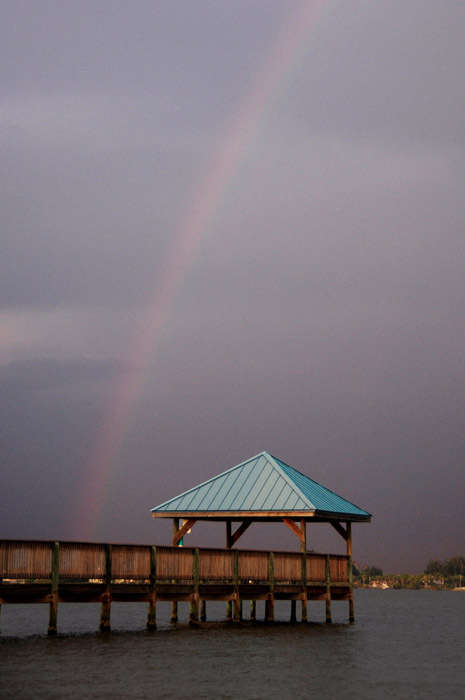 Late in the day, I waited on the shoreline at Rotary Park in Suntree in hopes to see a rainbow form. I knew the conditions were right. Sure enough, I was rewarded with a faint one. 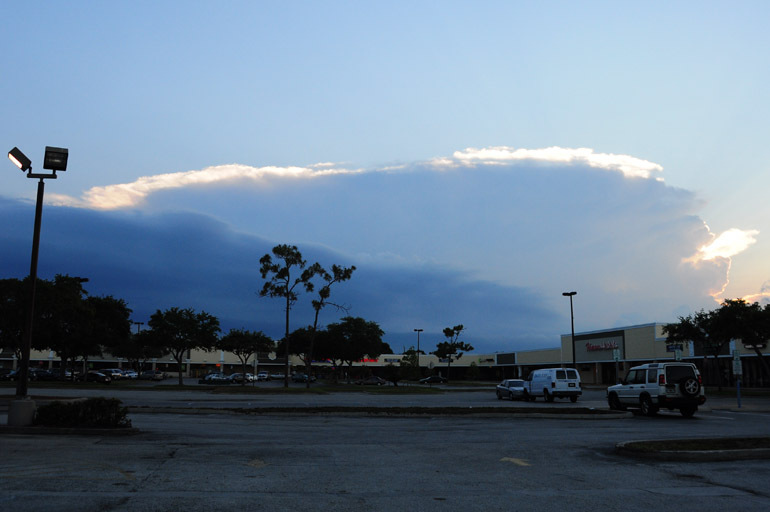 After sunset, around 8 p.m., a second storm system provided a more direct hit to central Brevard County, where I was working at the time. It was brief, but it did bring close lightning and about a minute-long downpour. 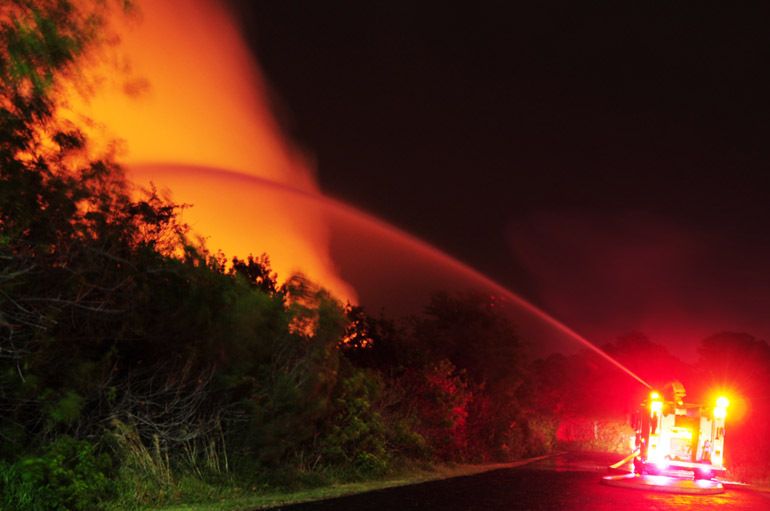 The lightning, however, was the story: It started this 10-acre brush fire that threatened some buildings in Viera, a well-developed unincorporated area of the county. There were several instances when the lightning crawled behind the flames, but this is pretty much the best I did in capturing that. 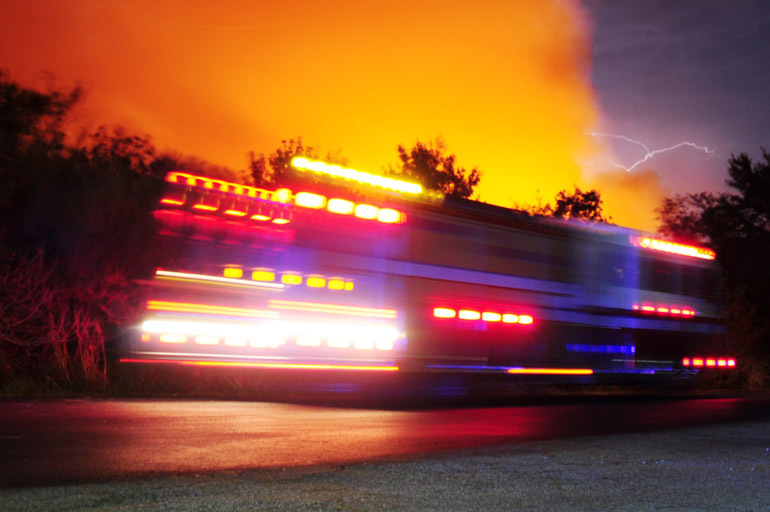 The fire engine is blurred because of the long exposure. More lightning flashed behind the fire. 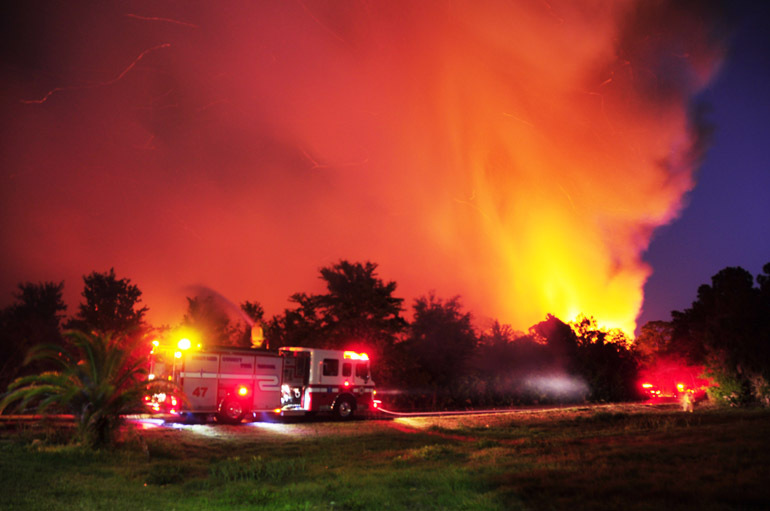 The thunderstorm was still very active as 30 firefighters attempted to contain the blaze. 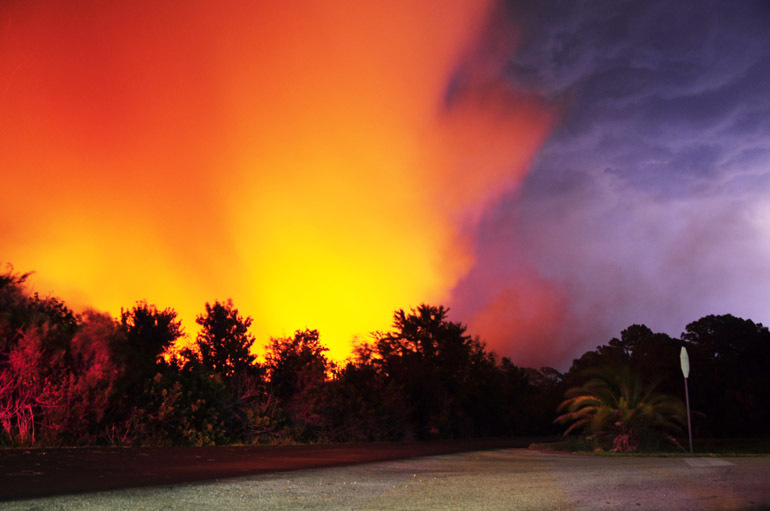 Lightning struck nearby and wind blew embers far from the flames. Those embers swirled throughout this frame. 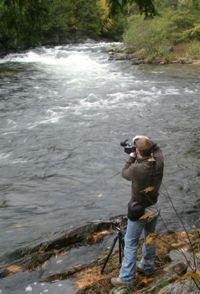 This is the shot that ran in the newspaper. 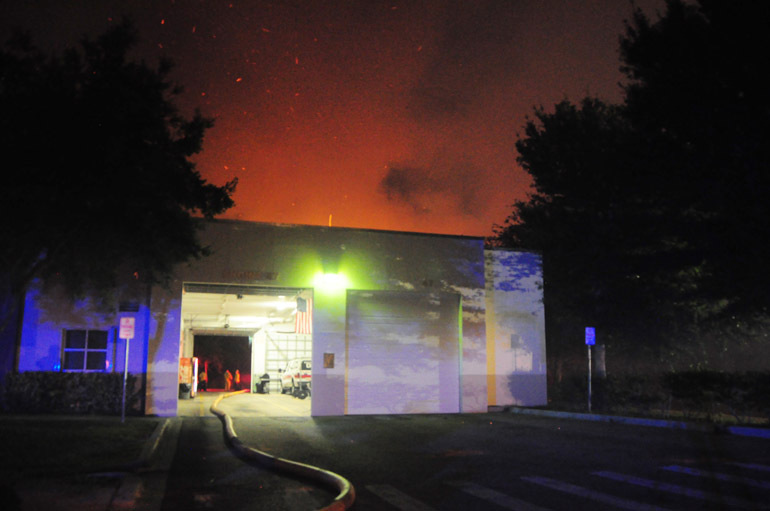 The firefighters waited to attack the flames until they neared this driveway, which led to a child care facility. There are stores and office buildings on the other side of the firetruck. The unique thing about this fire was that it was reported by the fire department. The firefighters from Engine 47 of Brevard County Fire-Rescue were responding to a call when they saw the smoke in their rearview mirrors. Their station is shown above. 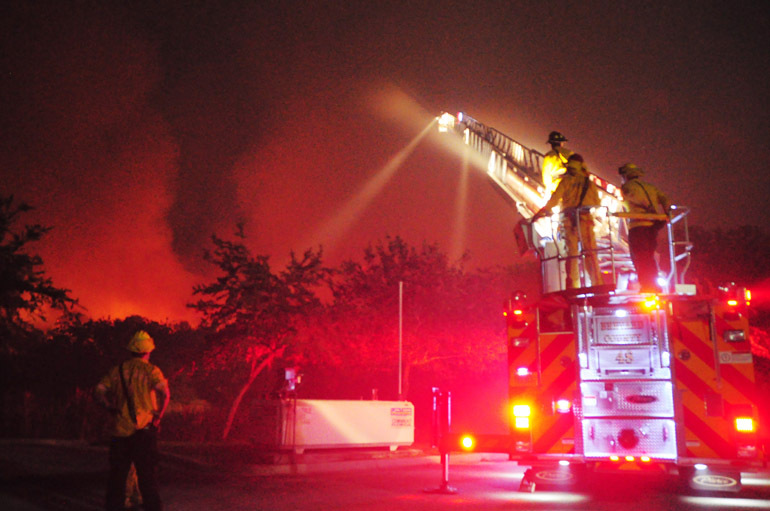 Firefighters used their ladder truck to get a bird's-eye view of the wildfire. They contained it, and despite some drama, no damage was done. No storms, just clouds. 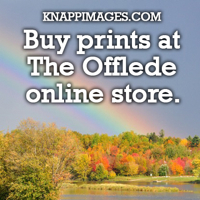 But after a long winter of mostly clear skies and lots of sunshine, this was a welcome sight. Taken with a phone. I'm guessing this was the most intense storm Melbourne has received this year. 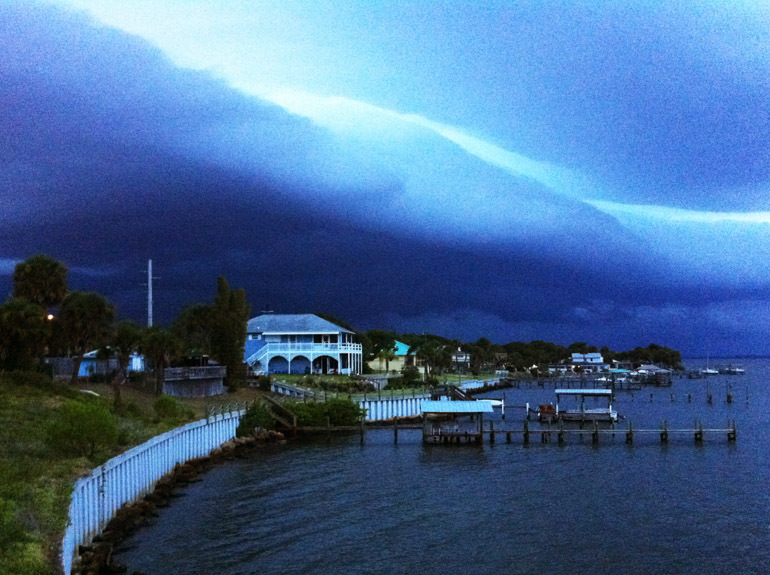 I was dining at a nearby seafood restaurant on the Indian River when it rolled in. I snapped this shot of the gust front with my iPhone. I went home and did not venture into the storm, but I did take one shot from my front "porch." We did not receive significant weather on this day, as most storms were confined to the state's interior. The Atlantic seabreeze was the strongest of the day, so it pushed far inland and collided with the Gulf seabreeze far to the west. 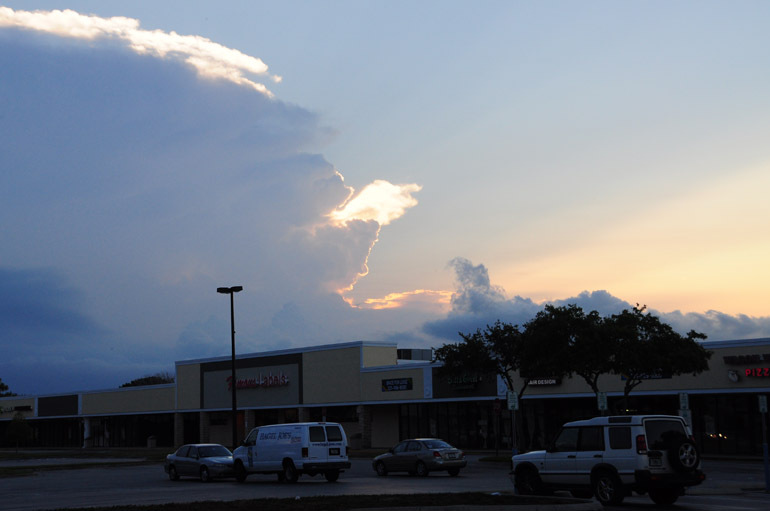 This storm created quite an anvil cloud. I think this storm was over in Osceola County. The sun set behind the storm. Some rays shot from behind this little tail that extended from the side of the anvil. 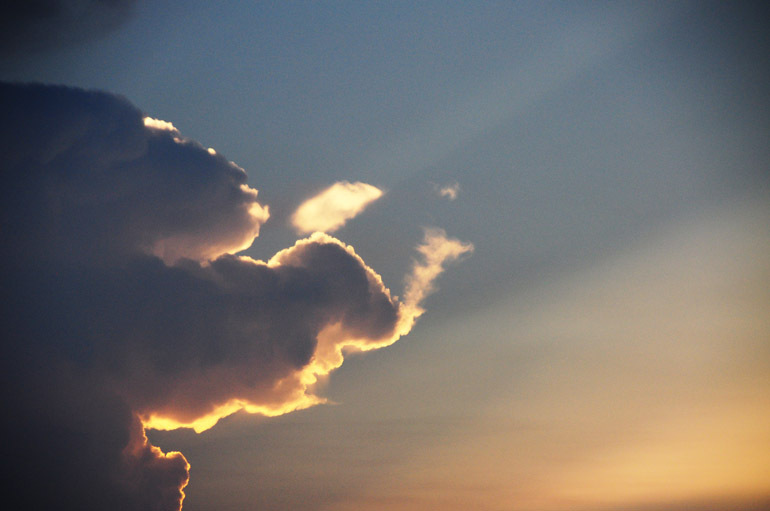 In more recent times, a trend of daily showers and thunderstorms has developed. On Friday, it rained in Melbourne from about 6 p.m. until nearly midnight. I was busy covering a homicide in which a man was shot and his buddies tried to take him to the hospital. 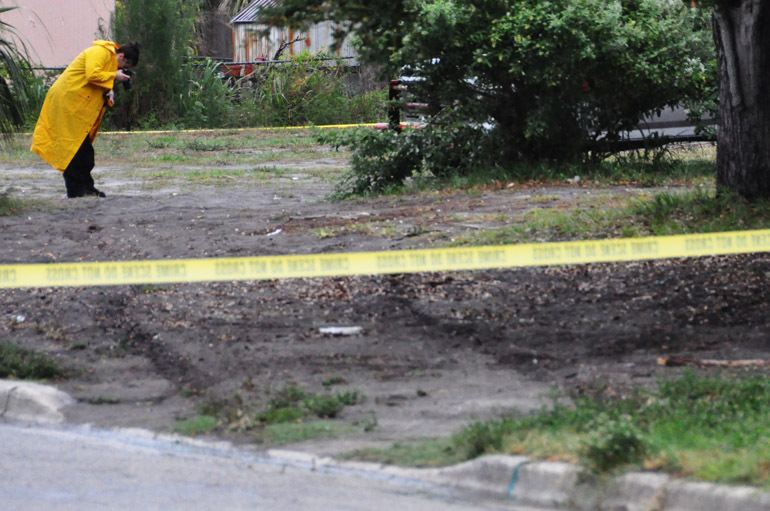 Crime-scene investigators struggled to document the scene during rainfall. Several police officers muttered to me things like: "It hasn't rained in weeks, but now that we have a murder outside, it rains."